Brick is one of the oldest, strongest building materials in existence. Today's homeowners have the luxury of a home clad in brick without the cost, weight or expense of the real material. Brick siding has become a popular alternative to traditional brick, in part, because it can be installed without the need for costly reinforced footings or special building permits. Another reason for the popularity of brick siding is its energy efficiency. The Brick Industry Association states that bricks have excellent thermal mass properties, which is a material's ability to store heat and slowly release it. In the summer, brick-clad homes stay cooler during the hottest part of the day, while in winter brick siding helps store a home's heat and radiate it back inside. Brick veneer siding, which typically uses a thinly shaved layer of real brick attached to a panel, can be installed in place of vinyl, wood or aluminum siding. It offers both aesthetic appeal and durability. In most cases, brick veneer siding is indistinguishable from traditional brickwork. Many companies have narrowed their business to focus solely on manufacturing brick or stone siding panels. Brick-It of Bohemia, N.Y., offers 1/2-inch brick siding that come in panels, or as a mortar-based system. Brick-It is installed over a scratch coat of stucco and metal lath. Novabrik of Montreal offers a mortarless brick siding system that features high-tensile nail-on bricks, which overlap and interlock. These can be installed by any handyman familiar with installing house siding. Other companies take a slightly different approach. Tru-Brix offers a thin, brick tile product that is attached to steel rails and mortared into place. FauxPanels of Deer Park, N.Y., a subsidiary of Barron Designs, manufacturers fake brick panels made of polypropylene. This nail-on brick siding panel contains no real brick. These are just a sampling of companies that specialize in brick siding. There are many more out there, including Clover Creek Brick Company, Endicott Clay Products, Glen-Gary Brick, McNear Brick and Block and Hanson VersaThin Brick. Most manufacturers have a slightly different manufacturing process and application method than their competitors. Brick veneer siding typically comes in standard colors, such as traditional deep or classic red, white, brown or used brick patterns. Many manufacturers also produce a range of blended colors with either smooth- or rough-textured surfaces. Some companies will make custom colors depending upon the quantity ordered. As a siding material, brick costs a pretty penny. Faux brick panels offer the lowest price-point at about $4.25 per square foot. For real brick siding, costs vary by manufacturer. Keep in mind that siding panels or tiles aren't the only thing you'll needed to complete the project. 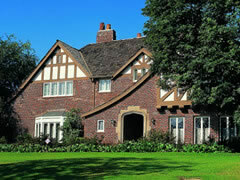 Brick siding manufacturers also make accessories, such as ledgers and cornerstone pieces. To get an accurate cost estimate, be sure to include all the materials necessary to finish a residential job. Many brick siding manufacturers offer a cost estimator on their websites, where homeowners can input square footage to get a baseline price. For new commercial buildings, the Brick Industry Association lists costs per square foot ranging from $19 to $21 for brick veneer with wood studs. Homeowners undertaking a residential project can expect to pay less, since they do not need to include wood framing in their bids. Homeowners will want to take into account labor costs to remove existing siding. Discussing your renovation needs with a qualified brick siding contractor or company sales representative can help narrow your focus and find the product that best fits your needs. The form on this page can help connect homeowners with a qualified brick siding contractor in their area.